The first Bridgeport Harbor Light, erected in 1851, consisted of an octagonal tower with a fixed red light on top of a box-like structure that stood on iron piles. There was no keeper's quarters, making it necessary for the keeper to travel back and forth by boat. Bridgeport Harbor was increasingly busy, and by 1870 it became obvious that a new lighthouse was needed. Captain John Brooks, Jr, the Bridgeport Superintendent of Docks and Wharves, was very influential in obtaining the new lighthouse. The second Bridgeport Harbor Light, finished in 1871, was a wooden dwelling with a tower attached to the front of its roof. The structure stood about a mile offshore on iron screw-piles and had a fourth-order Fresnel lens displaying a fixed red light. It also had a fog bell operated by striking machinery. The lighthouse was very similar to some others built in the same period, including New York's Long Beach Bar Light, Vermont's Colchester Reef Light, and Rhode Island's Pomham Rocks, Sabin Point, and Rose Island lights. 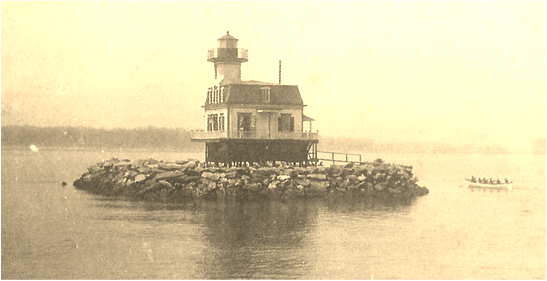 Bridgeport Harbor Light was a common destination for summer boaters, and was sometimes a winter attraction as well. During the severe winters of 1875 and 1893 the harbor froze over so completely that many people walked to the lighthouse. It was reported in 1875 that Dr. George Lewis and his wife drove a sleigh from the Bridgeport Lighthouse all the way to Fayerweather Island, near the lighthouse there. Kate Moore, the keeper at Fayerweather Island, told Lewis that in her 58 years on Fayerweather Island, no one had ever driven there on the ice. One of the most dramatic incidents in Bridgeport Harbor occurred in December 1920. During a brutal storm the steam lighter Calvin Tompkins developed a leak about a mile from Stratford Shoal Lighthouse. The vessel quickly sank and the crew boarded two rowboats. One of the boats was quickly swamped. Keeper William Hardwick saw from Bridgeport Harbor Lighthouse that the second rowboat was in danger of sinking. Hardwick launched the station's boat and rescued the seven men in the boat. Meanwhile, the men from the first boat had managed to cling to a raft and were picked up 20 hours later by another vessel. Three men had died as a result of the accident. Hardwick (left) received a letter of commendation from Commerce Secretary Herbert Hoover. Providence native Daniel McCoart became keeper in 1921. Two years later he married Elsie Toth, and soon Dan Jr. was born. 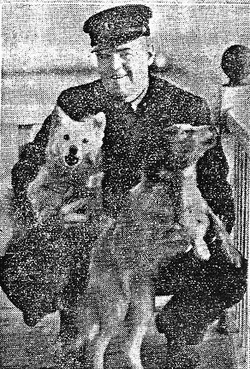 A 1930 article described lighthouse life for the McCoarts. The keeper rowed his son to shore each day, and Dan Jr. would scramble over the rocks with his lunchbox. The seven-year-old loved school. One day when the harbor was frozen over, he watched through a window all morning as the tide melted the ice around the lighthouse. By noon it was finally possible to get the boat in the water to get the anxious boy to school. Every room in the lighthouse was spotless. The entire interior was painted white and green. The living room furnishings included a table with a neat pile of magazines, a bookcase with all kinds of literature, a few comfortable chairs, and a stove for heat. There was a radio in the dining room, but it was never used except for the entertainment of guests. In the cellar were two 600-gallon tanks. One of the tanks stored kerosene for the light, while the other collected rainwater used for cooking and washing. Drinking water came from town in five-gallon bottles, which the keeper picked up by boat. A grocery boy and a milkman would deliver their goods to a specified spot onshore and wave a white handkerchief. At this signal Keeper McCoart would rowed ashore to fetch the supplies. Elsie McCoart, described as an excellent cook and baker, kept the pantry well stocked with canned fruits and vegetables and worked to kept the whole place in ship-shape condition. “Lonesome? Goodness, I don’t have time to be!” she told the reporter. Dan’s father would sometimes row a friend to the lighthouse to play with his son, and the family’s Samoyed dog, Topsy, was an always-ready playmate. Topsy was a gift to Keeper McCoart from a grateful father after the keeper had rescued the man’s son. Keeper Dan McCoart was involved in at least two rescues. On June 15, 1930, he rescued three people whose boat had lost its rudder in a rough sea by towing the vessel into Bridgeport Harbor. Less than two months later, on August 10, a small sailboat capsized near the station with two boys on board. One of the boys couldn't swim and was held up by the other boy until McCoart arrived and saved both boys from the water. The McCoarts left the lighthouse in 1942, and its operation was eventually taken over by Coast Guard crews. By 1953, Bridgeport Harbor Light was in such poor condition that the Coast Guard decided to replace it with a skeleton tower. The old lighthouse was sold to the Fairfield Dock Company. They initially wanted to move it ashore. But officials couldn't agree on where it would go, so it was decided instead to dismantle it for scrap. As it was being dismanted it accidentally caught fire and was destroyed. Left: The new Bridgeport Harbor Light, erected in 1953. Abraham A. McNeil (1851-1873), Charles Hubbell McNeil (assistant, 1851-1871), Waldo Lester (1873), Charles Hubbell (McNeil?) (1874-1875), Frederick Raymond (assistant, 1875-1876), Joseph H. Prindle (?) (1875-1876), S. Adolphus McNeil (1876-1901), Edward Burton (assistant, 1876-1882); Ole Anderson (1901-1903), Samuel Wright (1903-at least 1907); William Hardwick (c. 1920), Daniel McCoart (1921-1945), Ralph Lutinski (Coast Guard, ?-1953), Delphin Merritt (Coast Guard, ?-1953), Michael J. Walsh, Jr. (Coast Guard, ?-1953), Edward J. Sampel (Coast Guard, ?-1953), Otto E. Hessmar, (Coast Guard, ?-1953).